3-dimensional western artwork on the walls and soffet areas. Pedestal tables with “wild west” graphic tops. An Old West hotel kiosk with 2 TVs to show school news and sports highlights. Enclosed trash cans to eliminate those unsightly open garbage cans in the middle of the room. 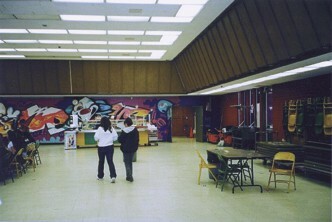 Before: This is a huge room, but very dull and unappealing. Very few students ever came into the room to eat. 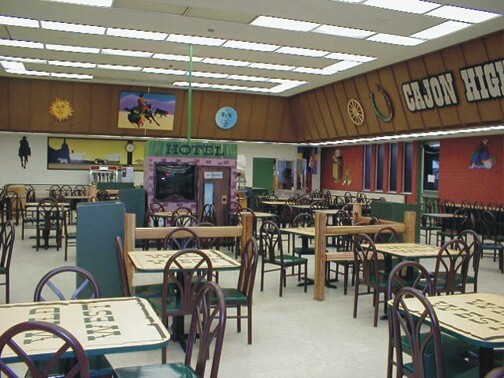 After: We created a western theme for the Cajon Cowboys – with a wooden stockade corral in the middle of the room and an old west hotel kiosk with two televisions to show school news and highlights of the previous week’s sporting events.